The first week of August 2018 had marked a very dark time in the history of modern era Bangladesh. The week that saw mostly school students aged 13-19 take to the street to protest for safer roads across the country. The event that sparked such movement actually occurred on 29th of July 2018 after 2 students from Shaheed Romijuddin Cantonment college were killed in an accident caused by reckless bus driving. There was a week-long protest which started of the in the capital city of Dhaka and within a short period of time it spread throughout the whole country and students took the streets boycotting classes demanding safer roads. In one side of the protest were the students who were demanding safer roads and justice for the death of their fellow students and the journalists who were covering it and the other side, in this case as the “villains” were the Bangladeshi Government, Bangladesh Police, Bangladesh Road Transport Authority and the main culprit as some might say Bangladesh Chattra league, the student wing of the ruling government party Awami League. some may ask why is a student wing of political party attacking other students? And why are they the main culprit? The reason being, they were on the forefront most of the violent attack on the protesting students and journalists. I’d like to point out again these attacks were carried out on kids as young as 13 years old. Before we get into the treatment of journalists, I’d like to point out some turning points of this protest so people who don’t know anything about it can get a fair picture. 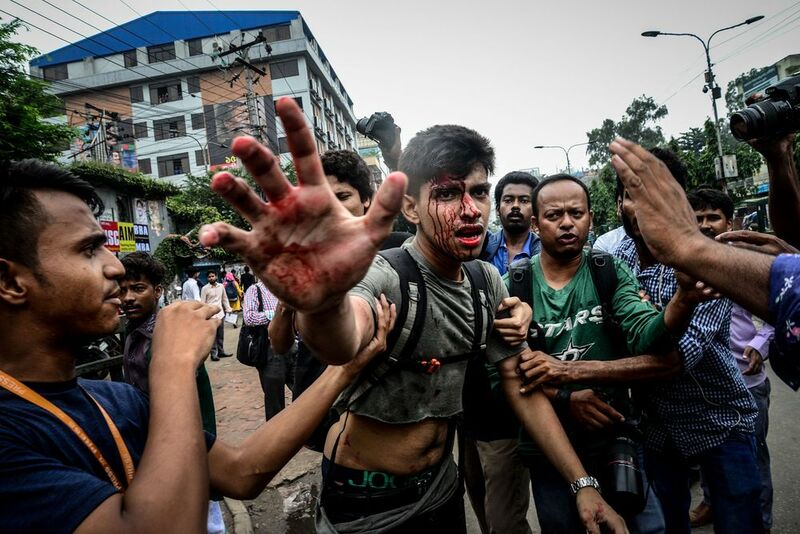 29th July 2018, Students protest around Dhaka. 2nd of August, protest spreads around the whole country. 3rd of August, Bangladeshi Government pays compensation of ৳ 2000000(2mil) to the students’ family who died in the accident. 4th of August, the government blocks all mobile internet access to control the protests. 5th of August, all mobile internet services are blocked again for the same purpose. 6th of August, a new traffic act was approved in a cabinet meeting. Students decide to go back to class. 8th of August, as of midday there wasn’t any sign of protest. At a glance, it seems like the country’s press were busy throughout the 10 or 11 days of calamity. If I were to put in sports terms I’d have to say that the country’s press was busy on and off the field. By that I mean literally busy being chased, attacked and some saw their cameras and other equipment. Here is a video I found on YouTube that shows only a few glimpses of it. Luckily, they’re subtitled and as far as my understanding of Bangla language goes, they’re pretty accurate. And here’s a video from al Jazeera on the man who inspired me to write this. I don’t want to fanboy too much but I’d like to add that, the Journalistic work this man does from a country to put it in a hip term I’d have to say “elbow deep” in corruption is admirable, to say the least. 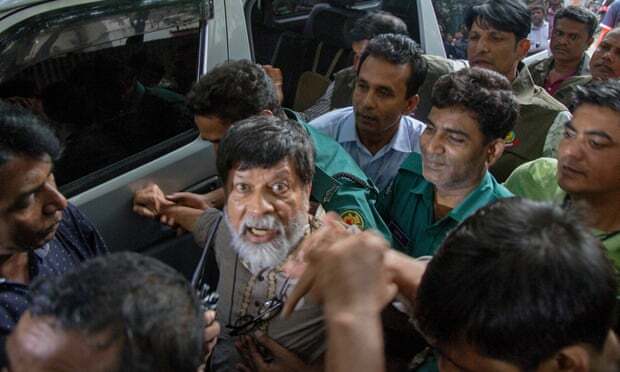 one of the other reasons I decided to write this regarding the treatment of the journalist rather than the actual outcome was when I saw Shahidul Alam’s interview on Al Jazeera. I remember watching it and thinking to myself this guy is going to land himself in a lot of trouble and so he did. After he had given the interview, on 5th August 30 – 35 plainclothes police arrested him from his residence. Police had covered the CCTV with tape and removed the hard drive for the camera feed. They had also managed to lock the building security in a room. And all of this was happening at 10 a.m. he was taken away in an unmarked car. His time in the jail was more than unfair. There were claims of him being beaten by the police and there was also the refusal of his medical treatment. Shahidul Alam was only the tip of the iceberg. According to reports, the entire press core was under fire by Bangladesh Chattra league and the police. 23 reporters were injured in targeted attacks. In the first video, I shared, as you can see at the start a female reporter is being attacked by the police. Not only that, reporters were being attacked with machetes, steel bar and sticks. Attackers were wearing bike helmets to cover their faces. And most of these thugs were reportedly involved with Bangladesh Chattra League or the governing Awami League. To tackle all this Bangladesh government sort of made the press their silent enemy. And as a result, they’ve brought in a new defamation law which clearly puts them in a driving seat of what gets published and it also makes it easier for the people in power to “silence” anything that might not be favourable to their own agenda. Which brings me to my main question, does this really mean press will have the freedom to stand up to the government’s wrongdoing? And if you’re someone like me who’s a journalism student but happens to be in Bangladesh rather than in Europe, how do you see yourself blossoming in a place that literally tries to take the free voice of press away? The answer is for yours to figure out, reader! I’ve often wondered in a world full of chaos is it possible to find freedom? Do “The Press” in some parts of the world really get to tell the truth as they’d like to or do always have fear the consequences of work? I’d like to finish a jolly note. So, towards the end of the protest, BCL supporters took to Twitter to post pictures of school students marching with banners to celebrate the end of the protest. 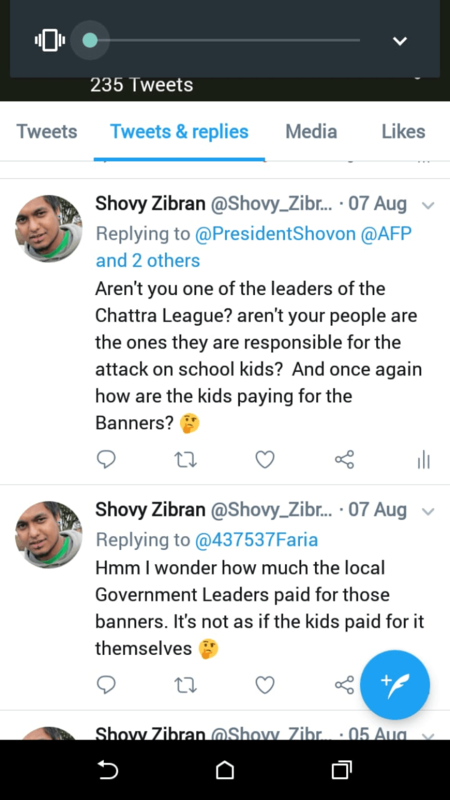 As being a curious cat myself I decided to tweet The President of BCL about the funding’s of the banners and 4 months later I’m still waiting for a reply. N.B. this is a college assignment. if the credits aren’t given properly or any facts supplied, other opinions, are incorrect please feel free to contact me through my twitter or Instagram.